Hot on the heels of my article last week about the Les Bartley award, a discussion opened up on twitter regarding renaming all of the NLL awards after some of the greats of the game. A bunch of names were tossed around, and the topic was mentioned on both Stealth Classified and Off the Crossebar, two of the top three lacrosse podcasts out there. Since I’m kind of the one who started it all (well, Jake Elliott actually did but it was in response to my article, so it was really me all along), I thought I’d throw out my picks. One thing that hasn’t been mentioned: there are only so many awards and there are a lot of great players that have come and gone in the NLL. So if you think Joe Laxalot was one of the best players but he’s not listed here, well, not every great player gets an award. Goaltender of the Year: Just about everyone will agree that this one comes down to two legendary goalies: Bob Watson and Dallas Eliuk. But which one? Going purely by the numbers, I’d have to give it to Watson. Eliuk had a higher career GAA (12.24 to Watson’s 11.14), higher post-season GAA (11.73 to Watson’s 10.16) and only won five Championships while Whipper won six (though that’s really a team accomplishment). Whipper also won Goaltender of the Year twice while Eliuk never did, though that’s hardly fair since Eliuk played ten seasons before the award even existed. But Eliuk played in a different era and had four titles before Whipper ever played a game, so perhaps the stats can’t be compared directly. The one and only time they met in a Championship game was 2001, and Eliuk not only beat Watson, but was named Championship game MVP. I’m going to let my Rock bias loose here and go with Bob Watson but it could go either way. Transition Player of the Year: It comes down to two players for this one in my opinion, Jim Veltman and Steve Toll. Both were quintessential transition players, with great defensive and offensive abilities. Toll had more blazing speed than Veltman so his abilities were a little flashier but Scoop was such a smart player. He had that Brodie Merrill-like ability to make his teammates better and allow them to excel (or more accurately, Merrill has that Veltman-like ability). Veltman is the only transition player in the NLL Hall of Fame and was the first non-offensive player (since joined by Steve Dietrich) to win the MVP award. Gotta go with Jim Veltman. Defensive Player of the Year: There are only two defensive players in the Hall of Fame: Pat Coyle and Rich Kilgour. I’m not a great judge of defensive ability – especially from memory, since neither of these guys have played in almost ten years – so I will defer to Messrs. Jenner, Elliott, and Challoner, all of whom picked Pat Coyle. GM of the Year: He only won the award once, in 2015 after his Toronto Rock finished 14-4 and made the finals a year after a 9-9 season, but Terry Sanderson also built the 2011 and 2005 Champion Rock. Maybe it’s my Rock bias coming through again but he’s my pick. However, Johnny Mouradian built the 1999-2003 Rock, who won four titles in five years, so he’s also worthy. The Philadelphia Wings went to nine Championship games in 13 years from 1989-2001, winning five of them. I have no idea if they had a single GM over that span or five of them, but if all that was the work of one guy, that guy deserves credit. I feel bad for whoever ran the team during that time since he clearly deserves recognition for doing an amazing job but I don’t even know who it is. Executive of the Year: Tough one. I don’t think there’s been one single executive that’s stood out as head and shoulders above the rest. I thought George Daniel did a good job of stabilizing the league over his tenure as commissioner, but was it worthy of renaming this award? Prior to the MILL morphing into the NLL in 1998, all of the teams were owned and run by the league, so there were far fewer executives to choose from. Nobody has won the Executive of the Year award more than once. Maybe we don’t rename this one at all. Teammate of the Year: You’d have to ask the players about this one; without spending time in the dressing rooms and travelling with the teams, there’s no way to have any significant insight on this. I think Teddy Jenner suggested Casey Powell but maybe this one remains unnamed as well. Sportsmanship Award: Only two players have won the Sportsmanship award more than once – Garrett Billings, who’s still active, and Gary Gait, who has the MVP award. My vote goes to Shawn Williams. In seventeen seasons, he only had five where he hit double digits in penalty minutes, and in 24 playoff games he totalled only 10. 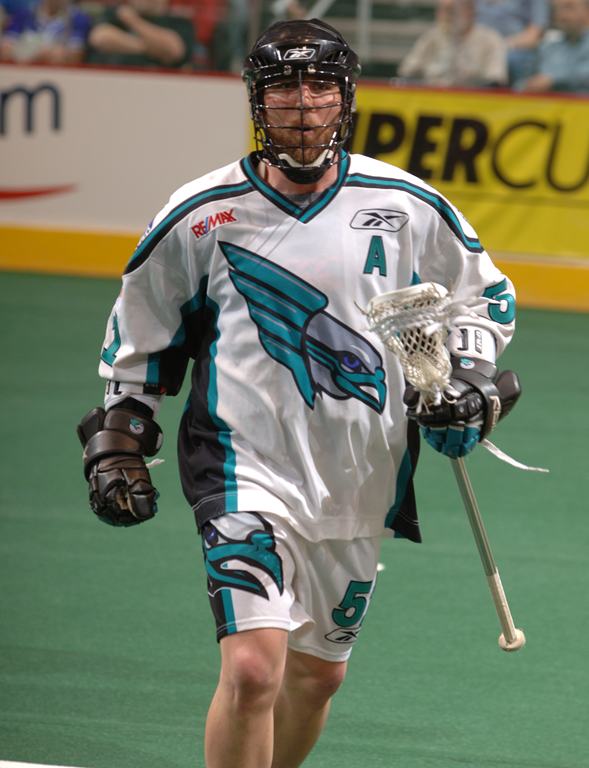 He was captain of the Knighthawks for several years, and an alternate captain in both Buffalo and Edmonton. It’s only fitting that the Sportsmanship Award be named for one of the most well-respected players in league history. Rookie of the Year: Another tough one since by definition, you can’t be good at being a rookie more than once. During the conversation on twitter, my Addicted to Lacrosse co-host Tyler suggested picking someone who won the award and then went on to have an outstanding career. While there are a number of RoY winners who qualify under that criterion (including names like Duch, Kelusky, Manning, Marechek, Merrill, and Benesch) (oh, and Gary Gait again), two of those not still active stand out: Colin Doyle and John Grant. Both have been very active in coaching kids as well, so naming a rookie award after them seems to make sense. I’ll get back to Doyle later, so my vote for this one goes to John Grant. Scoring leader: There is currently no award for this accomplishment, but when there’s such an obvious candidate, we need to create one. Gary Gait and John Tavares each led the league in scoring seven times (though they tied each other in both 2000 and 2004), and nobody else ever did it more than twice. Gait, again, has the MVP award but no listing of legendary NLL players would be complete without John Tavares. He really must appear in this list somewhere and I see no better place than here. Championship Game MVP: Colin Doyle is the only player to have been named Championship game MVP three times, and similar to Grant and Tavares, I can’t imagine a list such as this without Doyle’s name on it. Doyle was known as a clutch player his entire career, so the Colin Doyle award being given to the Championship Game (or Series now) MVP makes total sense. 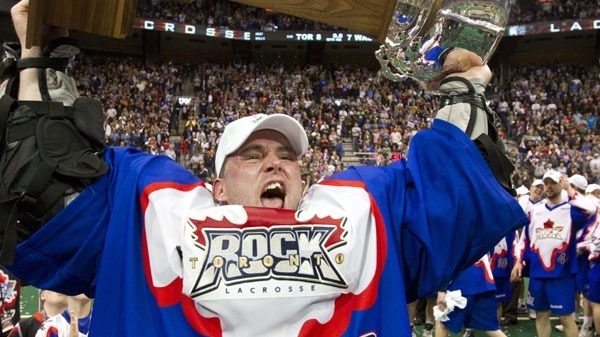 Champion’s Cup: IMHO, the ultimate trophy in the National Lacrosse League has a boring name. It’s boring because the Stanley Cup, the Mann Cup, and the Steinfeld Cup are all “Champion’s Cups” in that they are awarded to the Champions of their respective leagues. My first thought was to rename it after the founder of the league but in the NLL’s case, there are two. I can’t say I’m thrilled with “the Cline-Fritz Cup”, and “the Fritz-Cline Cup” will have people in thirty years asking who Fritz Cline was. The CLax trophy was called the Creator’s Cup which was a great name, but I don’t think the NLL should use it even though that league no longer exists. Another option is to name it after the late Jim Jennings, who was commissioner of the league for nine years (2000-2009). Though Jennings ran the league for a long time, many people have problems with how he ran it – a whole lotta cities had NLL teams fail on his watch. Still, “the Jim Jennings Trophy” has a nice ring to it. If I had to pick a name right now, that’s probably what I’d go with but I’m not stuck on it, so I’d probably elect to leave it for now as well. You really don’t want to get this one wrong. Having come up with my nominees for the renaming of these awards, it’s important to realize that once they’re named, that’s it. You can’t just go renaming these awards every ten years. Are the names we picked really worthy of that kind of immortality? Terry Sanderson was a great GM, but will we wonder in thirty years why Derek Keenan didn’t get that honour instead? Perhaps we rename MVP, goalie, transition, and defense and leave the rest for now. We can revisit in five years and see if we want to rename some more. One tiny nit to pick: Jeff Shattler won both the MVP AND the Transition Player of the Year award in the same season, so he’s another non-offensive player who has won the MVP award (although admittedly he spent most of his time on offense at that point and not on transition).